Navigate your Intuos2 tablet more easily with a Wacom 2D Mouse for Intuos2. This wireless mouse has three buttons and a scroll wheel for quick, precise navigation. The comfortable shape and symmetrical design helps to ensure that your creativity is unhindered. 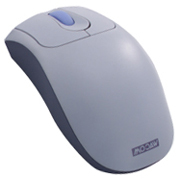 The mouse features Wacom's patented cordless, battery-free technology. It's PC and Mac compatible, too, so order one today and start using your Intuos2 tablet the way it was meant to be used.